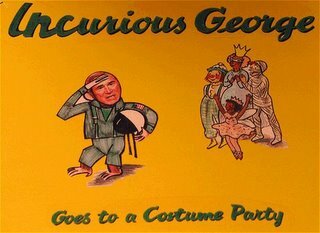 Thank goodness they finally let Incurious George ride his bike. All those meetings and discussions on policy and stuff were making him downright cranky. Let me get this straight. You are in Japan, Korea, China and other interesting Asian nations, where cuisine is a high art. And you eat at an Outback Steakhouse. Twice?!? No museums. No cultural events that aren't forced upon you by protocol with other world leaders. Nothing outside your comfort zone bubble. That's our Preznit. [Laura] has had little luck enticing her husband into joining her over the years. The first time the Bushes traveled to China together in their current capacity, she had to tell him to slow down as he tried to race through a tour of the Great Wall. She once persuaded him to go to the Hermitage Museum in St. Petersburg, only to see him burn through the place in 30 minutes. He dispensed with the Kremlin cathedrals in Moscow in seven minutes. He flatly declined an Australian invitation to attend the Rugby World Cup while down under. Okay, so the meetings are boring. The cultural stuff is tedious. The new food is icky. At least he has the bike rides. UPDATE: More on the non-productive jaunt to Asia in the WaPo. When President Bush was flying toward Asia a week ago, his national security adviser, Stephen J. Hadley, predicted to reporters in the back of the plane that the four-nation trip would yield no "headline breakthroughs." He turned out to be right. As Bush wrapped up his stay in Beijing on Sunday and prepared to head home Monday after a brief stop in Mongolia, the trip has produced no real breakthroughs of any sort. On a wide variety of issues, from trade to security to human rights, Bush won no concrete agreements from any of his summit partners. But the low expectations spin continues from the WH, who is saying that the Preznit never expected to bring home any agreement on anything anyway. Oh, well, good use of taxpayer dollars then. Ahem. How Did the Cat Get Out of the Bag?